When I was a kid, I loved to check out books from the library. But I didn’t read them. I liked knowing they were mine for two weeks. I piled them up on my little kid desk and felt special. I would look at the covers and be dazzled, knowing the books were filled with information I would never have to read. I knew how to read. But it wasn’t something I cared for. I always liked the general feeling of something rather than the specifics of the contents. 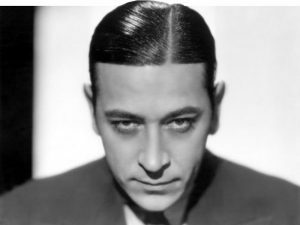 I once checked out a book about the life of movie star George Raft. I liked his face on the cover. He was handsome and dangerous. (That’s his picture up above.) I felt that was me. I had a good face, and I was into shoplifting. When I gazed at his face, I felt that I wasn’t alone in the world. I also bought books for the same purpose. I bought a book at our school’s book sale for fifty cents because it had a drawing of a county kid on the front cover. I felt that was me too. I liked the simple outdoors life. I liked to put a piece of long grass between my teeth, and keep it there. I never once looked inside that book either. When I in sixth grade, we had to read the book Treasure Island and write a book report. That book I opened up. But I didn’t read the words. I looked at the colorful artwork of scenes from the book and wrote about the story I got from them. I think I got a C on the paper. It might have been a D-. It wasn’t until I was in high school that I began to actually read the words in a book. The first one was Slaughter-House Five. The funny thing is, I checked out the book from the library because I was drawn to the cover. When I brought it home, I stunned myself by opening the cover of the book and reading the first page. It turns out, the feeling from those words dazzled me as much as the cover. So I kept reading until I got to the end of the book. Oh, by the way, Bee is my nickname.